Coloring with diverse media without smudging printing ink is a concern with new to digi stampers. 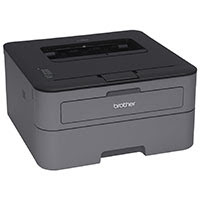 If you are looking for an economical printer that will give you the best results choose a b/w laser printer. You can find a low end Brother model to do the job for as little as $60 US. Shop around, there are deals to be found. The laser toner will take your alcohol markers and watercolor without smearing. The toner cartridge lasts a long time and the aftermarket replacement cartridges are as inexpensive as a dye ink pad. If you using an inkjet printer there are printer options that will be helpful and user-friendly to most media. 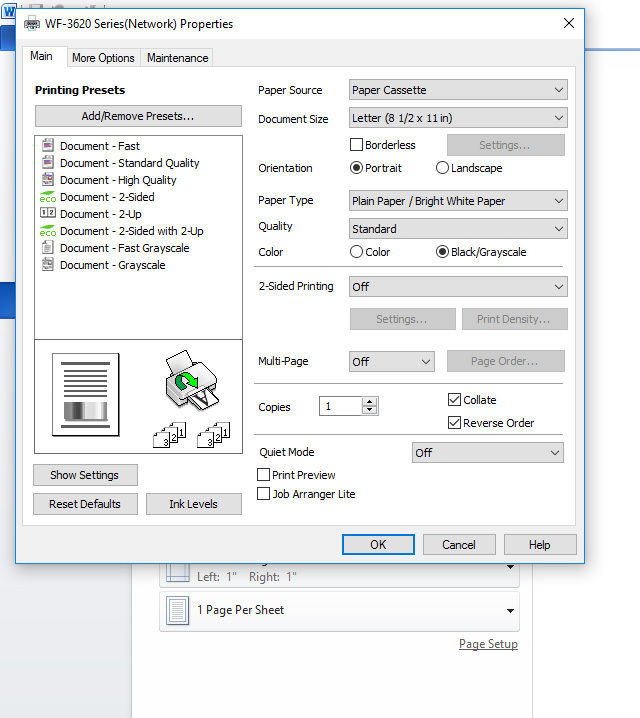 Prior to printing you should be able click on a new window to reveal "printer options." You want to select grayscale printing. 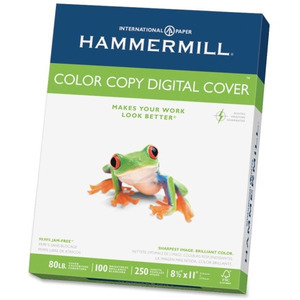 Not only will it save your ink, the printed page can work well with your diverse media. In the sample on the right, "Lil Love" was printed on an Epson Workforce printer using the grayscale option. (Cardstock setting was also selected and the paper is inserted in the back of the printer) There was no waiting time, no heat setting. Copic and inexpensive alcohol markers work beautifully. Watercolor and pencils, no worries. The Tombow marker will pull the printer ink -- but I really worked it in. If you are careful wit the pointed tip you can avoid the ink lines and will have no problem. I have had success with grayscale printing on several inkjet models. Looking for a new inkjet printer? 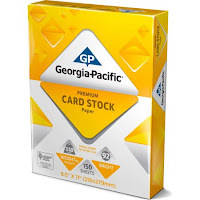 Make sure it can accommodate cardstock. (Papers discussed in last weeks post). If you do not need color printing an inexpensive b/w laser is the way to go. 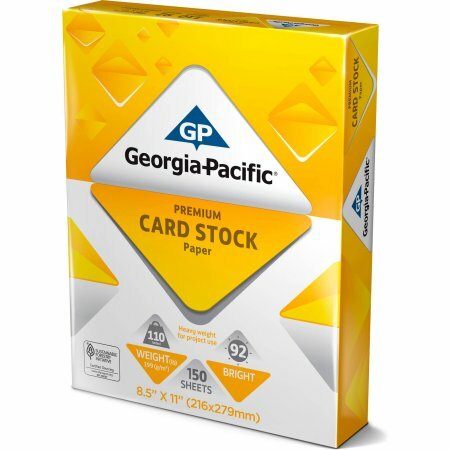 Some choose to go to Staples or Office Max for their printing purposes. Load up your layout with as many images as you can. Save your file to a flash drive and take it to your chosen copy center. Many places will charge $ .18 - $.25 for a single color or b/w laser copy. Request color laser copy if possible to get the blackest black. If you bring your own cardstock or request theirs the cost will be the same. 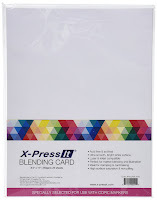 There are many paper types out there and it can be overwhelming to choose. How you work, what type of media you prefer and how much are you willing to spend are factors in your decision making. Reams of paper vary in weight and price. In the US we measure by lb. GSM (gram per square meter) is the Euro weight. The heavier the paper weight the more substantial the paper. Paper is measured in the weight of printer's sized sheets (not the size you put in a home printer). Depending on the paper type printer's sheets can vary in size so it can become even more confusing! While I like a heavyweight cardstock many home printers do not. I have printed up to 110lb and preference a 100lb. paper. I find a 65-80 lbs. weight acceptable, this compares with about a 150GSM. I have tested four papers with Copic markers and Prismacolor pencils and this is what I found. This is my personal favorite. It is a bright white very silky smooth paper. The paper takes the printing ink very well and gives you a crisp image. Copics blend very well with no feathering and maintain true colors. Prismacolors go down smoothly. It is a very reasonable price at about $10-12 a ream. The heavier stock costs a little more. I had switched to 80lb. just to take a little stress off the printer and it does the job. Personally I prefer this white over the other samples. Neenah is my second choice, although I think all these papers you will find suitable for digi stamp printing and coloring. 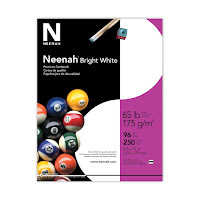 Neenah Bright White takes both Copic and Prismascolors well maintaining true color and vibrancy. Ink prints crisp and clear. The 65lb. weight does not give the substance of the heavier weight but it works and can also be found for a few dollars less. The white has a bit of a yellow cast to it when compared with the other samples. 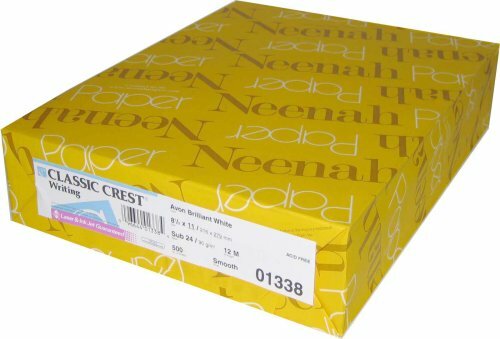 Many crafters preference the Classic Crest Super Smooth Solar White 80# Cover 8.5"x11" 250/pack. this paper is about $36.00 a ream. I had ordered the wrong paper but was still happy with Neenah quality. The Classic Crest Solar White does get great reviews but I do not have it to compare. I have read that people love it or hate it for Copics so I suppose it depends on the artist. For 1/3 the price I found the Premium Card Stock a decent paper. 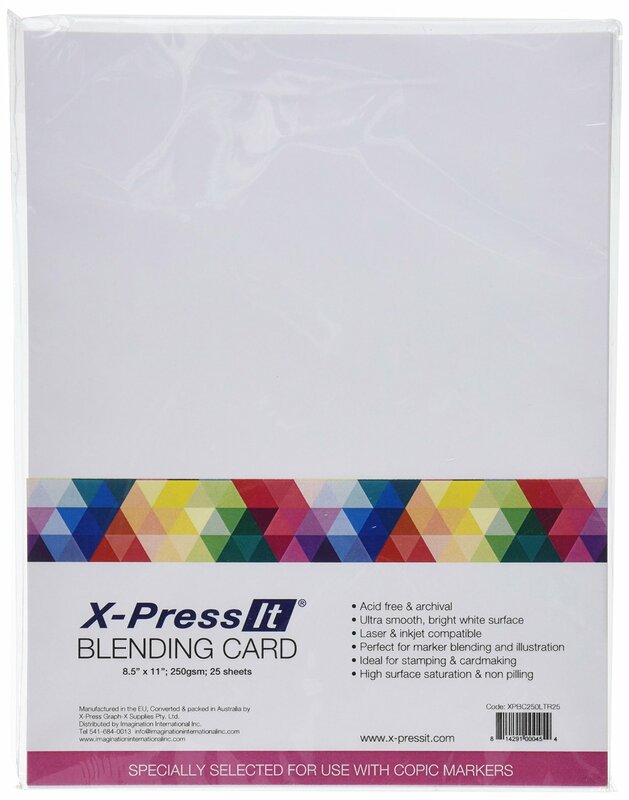 This is a bright white smooth surface paper designed by Copic for Copic markers. The white has a bit of a blue- gray cast. It is a pricy paper at about $15-$16 for only 25 sheets. While the markers blend very nicely on the paper's slick surface I found that color loses a little vibrancy and washes out unless you add multiple layers. The paper is designed for alcohol markers so pencils are not compatible for my tastes, I like a little more tooth to grab the pencil. Not much of a fan for these reasons: cost, too white, not good for combining your media. If you are new to digi stamping or on a budget this is a great starter paper. Many crafters use this paper. You can pick up a ream for about $5.00. 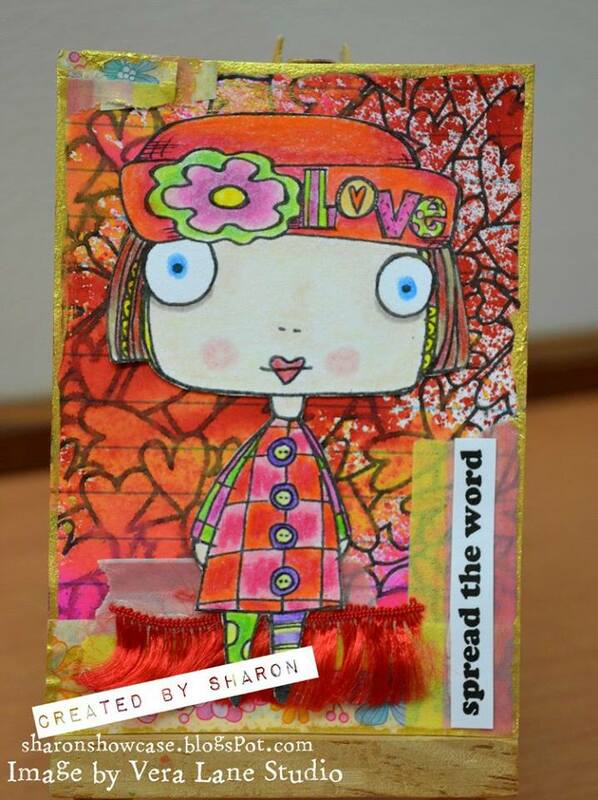 This cardstock keeps colors very true but is a little trickier to blend with alcohol markers. It will leave a little streaking if you aren't careful. It's a nice bright white and closest to the X-Press It in hue. The surface is not as smooth as the Hammermill or X-Press It. It does have a little more tooth which makes it better for pencil. If you like combining the two on your images this paper is a fair choice. I have the above mentioned papers from experimenting while searching for a good all-purpose paper for my digi stamps. The Hammermill is my go-to and pretty much the only paper I use lately. Choosing the right paper is a matter of preference and how you work. There are other papers available that I have not reviewed, therefore this review is limited to the above products. If there is a paper you prefer please mention it in the comments. 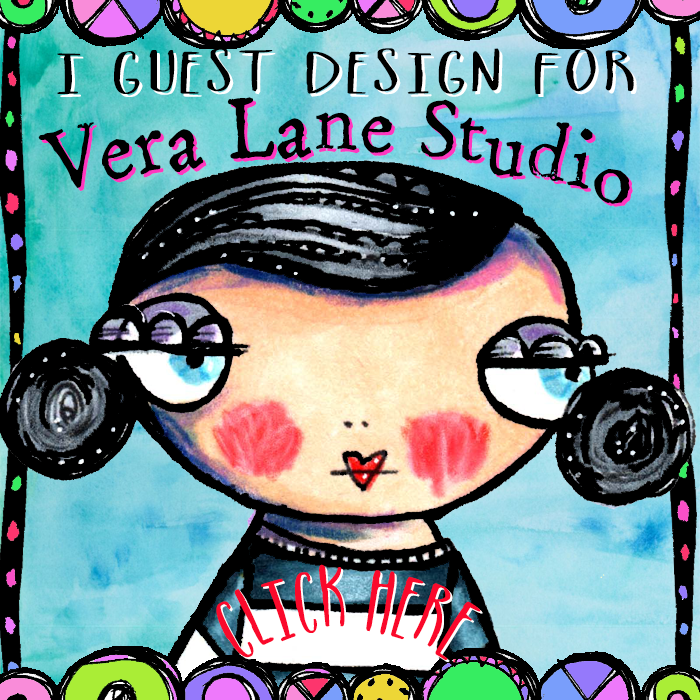 Hello and welcome back to Vera Lane. I have been absent on the blog scene post two eye surgeries but my goal is to get back and hopefully provide some useful information for new and old fans of VLS. 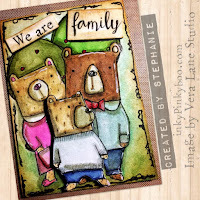 A digi stamp is designed by an artist much in the same way a rubber stamp is designed with the crafter in mind. Many applications overlap. 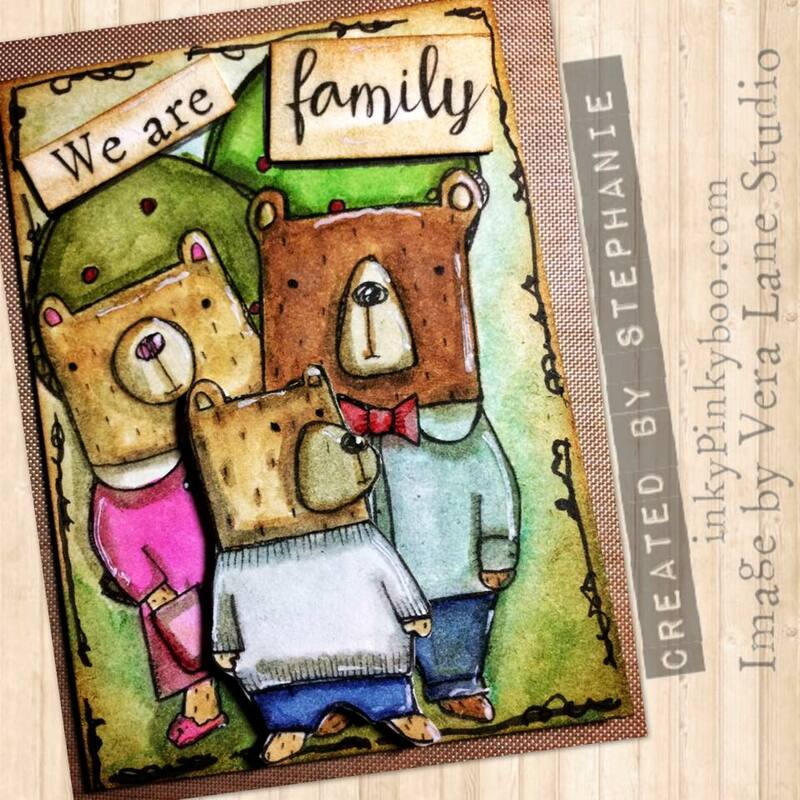 A digi stamp is readily accessible and downloads after purchase. The files are stored on your computer and can be used over and over again. 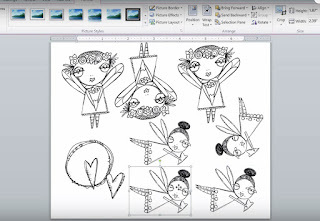 Digi stamps are digital files scanned, cleaned and saved in high resolution jpg or png format. What does that mean? 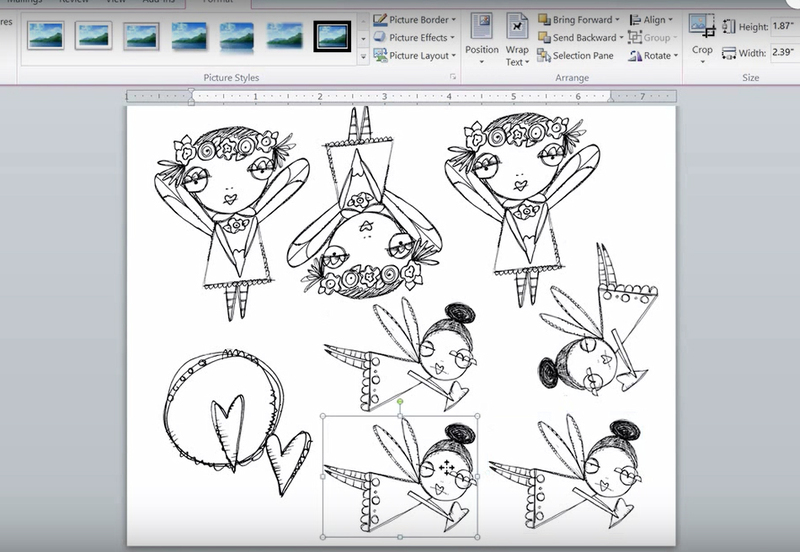 You can resize and your image will still be crisp and clean, ready to color! Images are brought into your graphics program (or even a word processor such as MS Word) and manipulated to your liking and printed on your computer for purposes of paper art crafts. A digi stamp, unlike rubber, can be resized, made thinner or thicker, reversed and rotated. If you are using png images, images can be combined. For example: this character on the left does not come wearing a hat -- the hat image can be resized and stretched or pinched to fit any character. Images are layered on your screen. "Love" is also a separate digi stamp. Sharon reduced it to fit on the brim of the hat. The combined image is printed, colored and fussy cut as one. The png image holds no white space around it. A jpg file has a "white box" surrounding the image. You will not be able to layer a jpg file in the way you can manipulate png files because the surrounding white box is in the way. 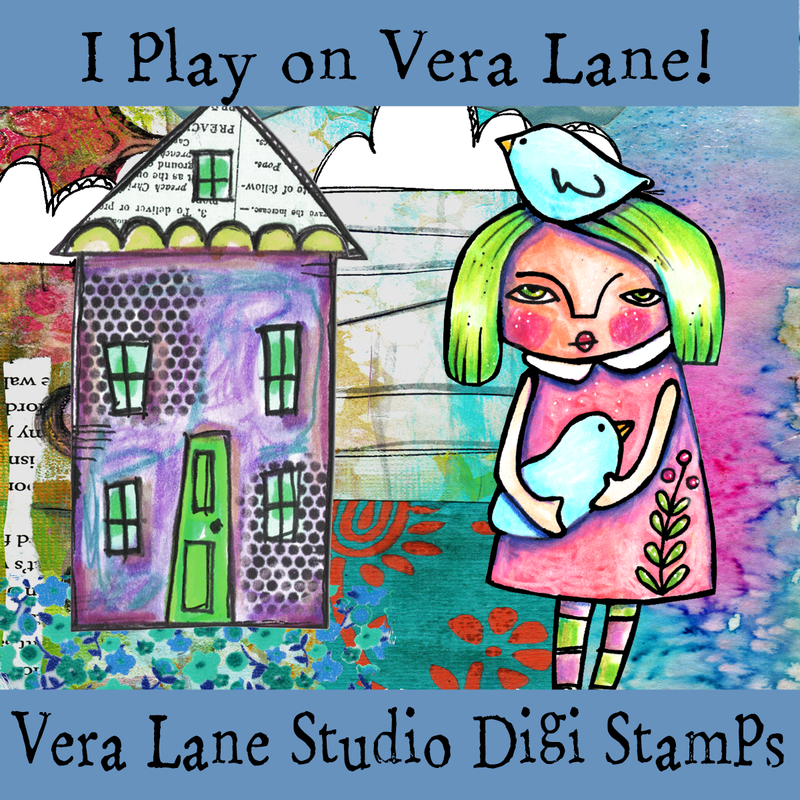 When using a jpg you will have to print, manually layer and fussy cut as you would with rubber stamps. Sizing for overlaps with jpgs may be trickier since you will do this post printing your sheet. Many images readily available for instant download with no shipping costs! You can see that digi stamps offer a wide range of design opportunities. 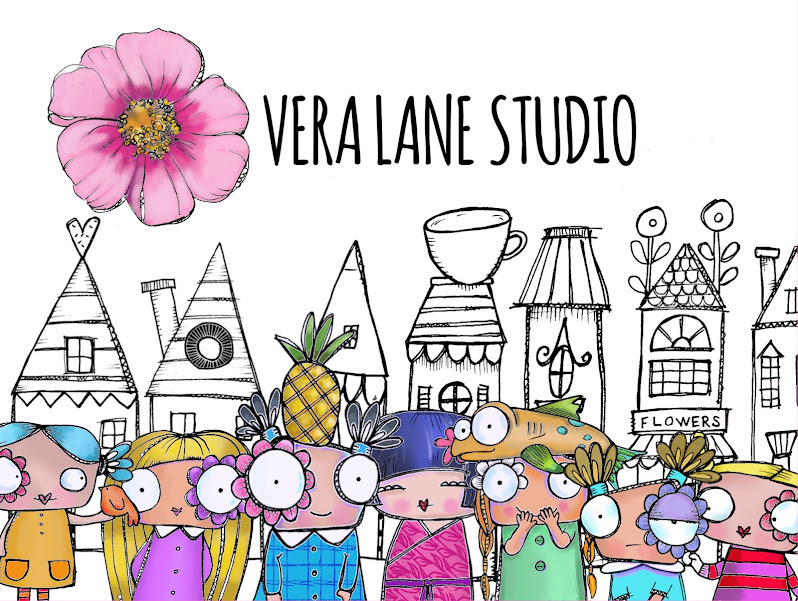 Vera Lane Studio is the leader in value priced bundles. Our sets work together to give you an unlimited possibilities for your paper crafting . Most of our sets come with sentiments additional images and image accessories that can be combined to suit your design tastes. Getting started is as simple as opening a word-processing program such as MS Word. You do not need fancy software. Photoshop, Photo elements, Publisher and even free downloadable programs will do the job as well. Creating a page layout is fun and easy. Bring your image file in, resize and position. Work with single items or create a scene. 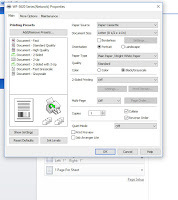 You can squeeze many images on a page to print out and store in a file folder to color later. We have a few videos on our YouTube channel to get you started. Our closed FaceBook community has many talented members including our fabulous VLS Design Team eager to help and advise. If you are not already a member come and find us and join our friendly community! Next week we will talk about printers and papers.